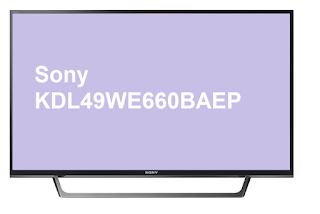 What I particularly like about the Sony KDL49WE660BAEP TV is its clean and elegant design. The stand looks solid and the overall feeling is for a quality build product. Something I also got from my two Sony LED TVs - the Sony Bravia KDL-40WD650 and the smaller Sony KDL-32EX650. Of course having YouTube and Netflix and the touch of a button thanks to the built-in WiFi is another great feature here. Prices for Sony KDL49WE660BAEP vary around $500 but these days can be found cheaper on Black Friday offers. Thank you for checking my KDL49WE660BAEP consumer opinion. I will be happy to hear your thoughts about this Sony TV.